Here’s my shot for Jenn’s Time Warp Tuesday and I’m early, even! A miracle! 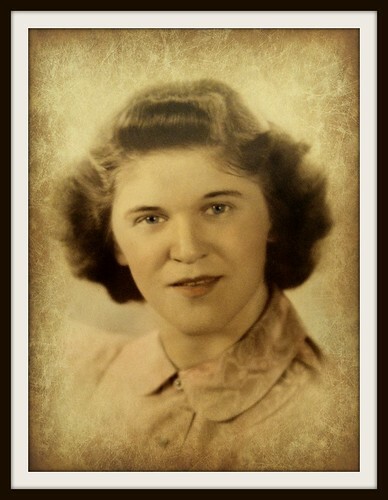 Sunday would’ve been Mom’s 89th birthday. This picture was taken at her high school graduation and even though she didn’t have me until she was 35, this is how I remember her looking. Guess I know where my young looking genes came from (although I’m afraid age has finally caught up with me). As I mentioned on Facebook, Mom would’ve been SO happy that Dave and his family are in my life, and that Cindy and her family are in my brother Larry’s life. I think it’s funny that my brother and I found mates that had three kids each kind of early in life, and that both became grandparents while relatively still young. The one thing Mom wanted more than anything was grandkids, and oh to have greatgrands, she’d've been absolutely thrilled! She would’ve enjoyed the heck outa Ralphy, too, the little rascal. Beautiful lady! I love her classic 40s hairstyle. My mother’s oldest sister wore hers like that for another 25 years after the 40s and I was always fascinated at how she got her bangs perfectly rolled up like that. As others mentioned on facebook, I suspect that your mom is enjoying the heck outta those greatgrands even now. She sure loved kids. I know you two butted heads a time or two, but she loved you and Larry so much. And I never doubted for a second how much she loved me. Gorgeous photo. Apparently the genes run in the family.